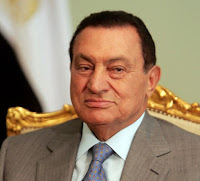 Its almost a week now that People of Egypt are on the roads and doing massive protests in every City specially Cairo against Egyptian President Hosni Mubarak and demanding him to Step down from Presidency of Egypt on which he is sitting from last three decades. Till now 15 People including Civilians and Policeman are killed in these protests and several Government buildings are also burnt by the Protesters. More than 1000 Protesters are arrested till now by Egyptian police and thousands are many are tortured but Protests are on the rise. Egyptian Opposition Parties and Major Islamic Group Muslim Brotherhood are also taking part in these protests. Muslim Brotherhood has said that we will continue the protests until Hosni Mubarak resigns from Presidency. Lets see will Egypt be able to get Revolution like Iran and Tunisia or Mubarak will be able to continue as President of Egypt?